It is very common among trade show vendors to gift pens and pencils along with their promotional flyers during the event. However, smart people always select accessories for pens and pencils such as custom pencil pouches because they know the difference it will make to their campaign. 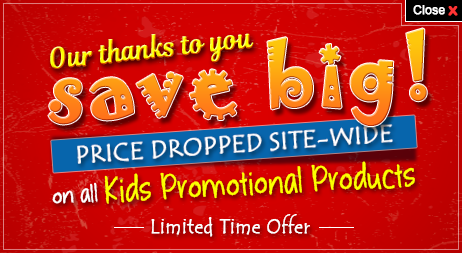 Promo4kids.com offers a selection of affordable promotional pencil pouches that can be used to stock pens and pencils. 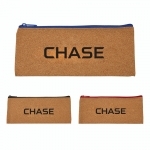 Your brand logo will be visible over these pouches. 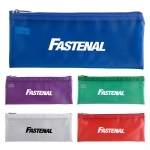 Logo pencil pouches make great thoughtful back-to-school gifts, awareness promotions and more. Available at extremely affordable prices, you can literally save on online design proof, artwork assistance and promotional efforts. Fast shipping is offered anywhere within the contiguous USA. Take advantage of our fast production time. Picking the right promotional gift means considering the occasion, situation and time of the year. Imagine how much your young customers will appreciate your efforts when you give them customized pencil pouches on the first day of school. It will give parents a relief that they can save on pencil case and use the money for other purposes. Just imagine all those promotional mileage your brand will enjoy when kids carry these pencil pouches to their classrooms! 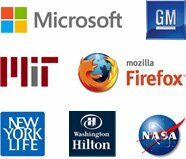 Your brand logo will easily become the talking point among students. In short, these pencil pouches will ensure that your young client's school accessories are in order while offering lots of promotional opportunities for your business. Best of all, these promotional pencil cases are low-cost business gifts that all your young customers will love and adore. By investing in these promotional cases for pens and pencils, you are buying an easy acceptance from young crowds and large imprint area on its front. 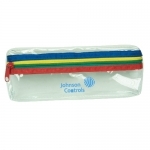 These cases can hold pencils, pens, highlighters, erasers and other school items. Ideal for marketing schools, tutoring services, office supply companies, summer camps, art and craft schools and more. 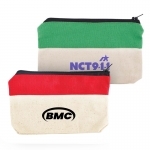 You can gift these personalized pencil cases to potential students or their parents during fairs, community events, trade shows, Back to School Month, school spirit events, fundraisers, church fairs and more. So whether your recipients want to keep their writing instruments safe or organize their study tables, these pencil cases will help them. Every time they take out a pencil or pen, your brand logo will play before their eyes. However, this will happen only if you order from us today! 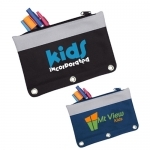 Promo4kids.com offers a thoughtful selection of customized pencil pouches in different colors and prices. 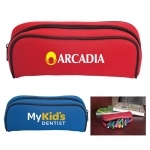 If you need any help to find the right pencil pouch for your campaign or budget, just give us a call today at our toll free number 855-454-3786 or write to us at info@promo4kids.com.